Turn north for another mile to the tumbled down stone circle on Candlehill, a common place name of the map, perhaps the memory of a hill-top beacon. Go up the edges of the fields on the right of the road and over the fence at the top. A disused quarry mars the site - take care. 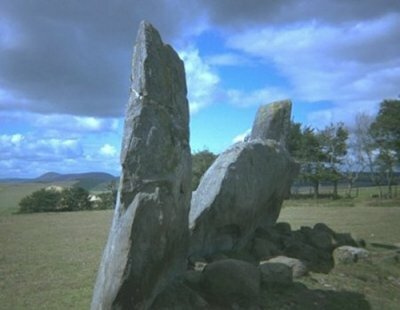 All the big stones of this circle are toppled and mossed-over, except the Candle stone to the east, but there is a large complete and undisturbed mossy central cairn within the circle.